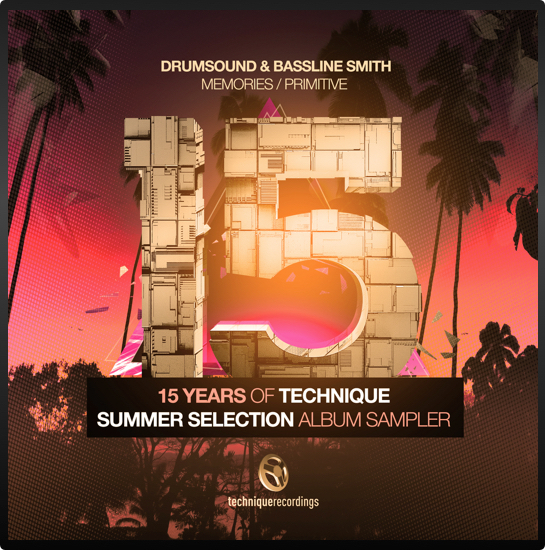 To celebrate 15 years deep in the game, Technique Recordings are dropping a Summer Selection album to soundtrack the sunshine properly. This first taste of the album comes from label bosses Drumsound & Bassline Smith who, judging by their show itinerary, know a thing or two about hyping a festival crowd. It’s time for the ravers to raise up their hands immediately as Memories floats in. A rising chord structure delivered by a subtle combination of keys and pads provides a foundation for an elegantly percussive synth melody. Add in a ghostly vocal sample and this tune casually casts a cloud of euphoria over the party. The deal is sealed when the drop provides the weight of bubbling bass and effortlessly punchy drums to the mix. This is a tune that’s as uplifting in the midnight haze as it is under blue skies. Then there’s a different mood for Primitive. Dramatic stabs kick a hole in the atmosphere, punctuating a pattern of ever-rising arpeggiation overlaid with a suspense-laden dialogue sample. And that’s just the intro, before sirens signal a build into a high-voltage drop made of a taut razor-wire bassline and uppercut-force kicks and snares. Rolling high-end percussion and those blockbuster synth-strikes keep the energy at IMAX dimensions. When it’s that time for the carnival crowd to properly let loose and go just a touch grimy, this is one to draw for. So, Drumsound & Bassline Smith have shown us two angles on the sunlit rave experience. And with a decade and a half of experience feeding into the Summer Selection album, this is clearly just a small taste of what’s to come. Better grab your shades and your sunscreen, because Technique Recordings are about to light up the summer.